With over 500 independently-minded hotels that span the globe, Small Luxury Hotels of the World (SLH) has everything from boldly designed urban sanctuaries to palatial mansions nestled in the countryside. In the historic Bedfordshire, the magnificent Luton Hoo Hotel boasts an 18-hole golf course, and a handful of picture-perfect wedding venues and private fishing lakes, among other luxuries. Over in Barcelona, the design-driven Grand Hotel Central offers contemporary comforts and first-rate facilities aplenty. Regardless of the location, the group consistently delivers personalized and one-of-a-kind experiences, providing its guests with only the best of the best. To further encourage you to take a break from your daily routine and see more of the world, SLH is launching an exciting global sweepstake you won’t want to miss out on. Members who book their stay with the group by the end of November will stand a chance to win 20 free nights at any SLH property in 2017. With such a diverse collection of properties to choose from, the lucky winner’s hardest task will be deciding where to spend their 20 complimentary nights. For more information, visit Small Luxury Hotels of the World. 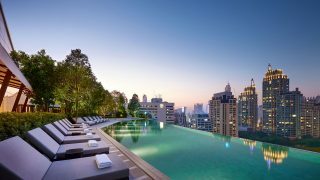 Small Luxury Hotels of the World (SLH) has unveiled Invited, a new loyalty program. 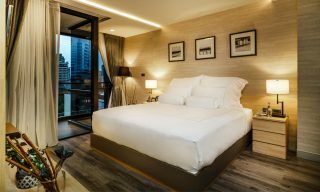 The group’s latest hotel openings include Sukhothai Shanghai and Akyra Sukhumvit Bangkok.